Lunagirl Moonbeams by Lunagirl Vintage Images: Garden Fairies are Popping Up Everywhere! Both by Vicki Romaine of the Cheerful Stamppad. 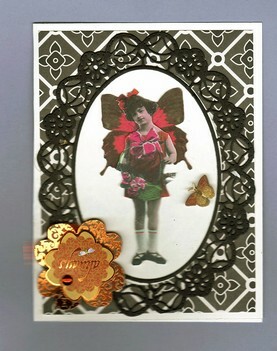 Here is a charming 1929 Girl fairy with bright wings and a gorgeous frame and embellishments. "I love using black and white as a background. This time my fairy stands inside a Cheery Lynn die." "Here is a tag using a technique from Use Your Words workshop by Carolyn Dube. The technique consisted of putting letters in the background and then glazing with polymer medium gloss. 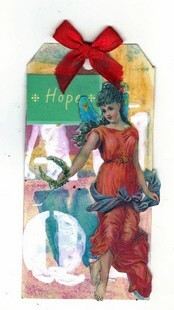 In addition I added a fairy from one of Lunagirl's collage sheets and then glazed her also."